Download a printable version of Finding your way around a Home entry (1.2MB PDF). Download a printable version of Finding your way around the site (1.15MB PDF). 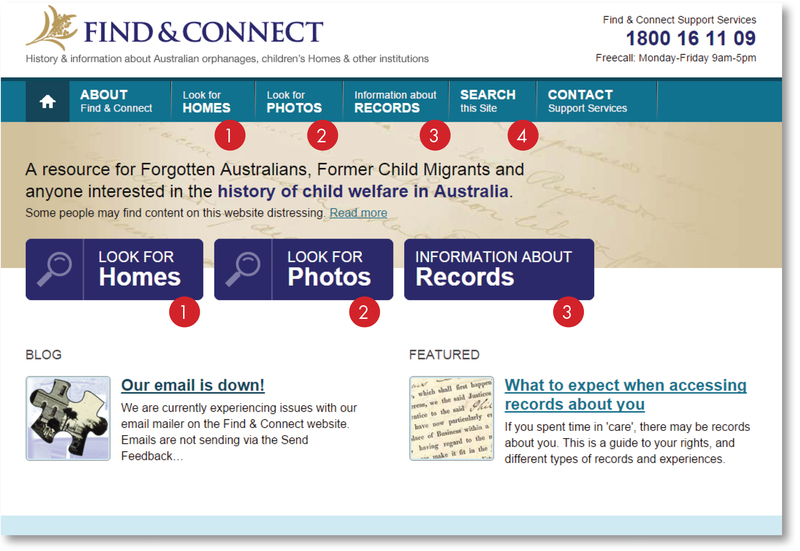 The Find & Connect web resource brings together historical resources relating to the history of institutional ‘care’ in Australia. In June 2015, it has over 2,000 entries about children’s Homes in every state and territory. 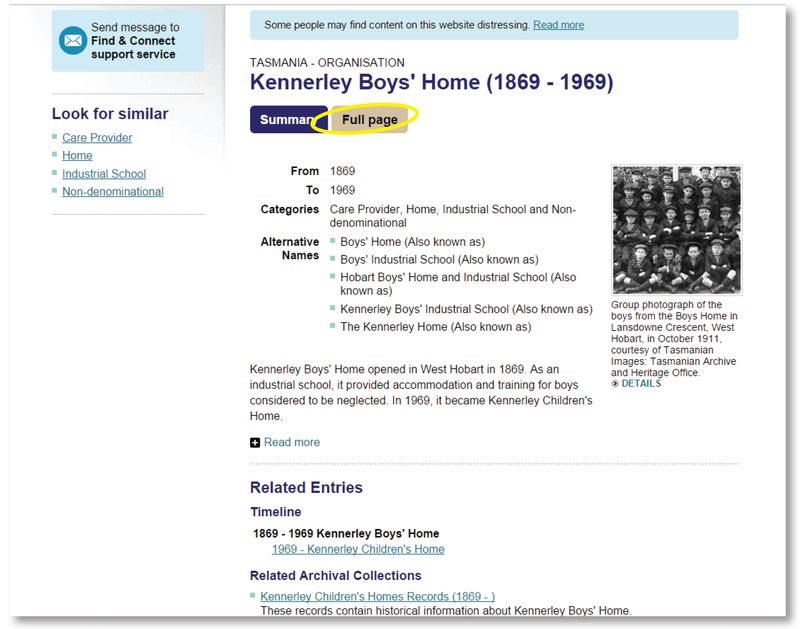 Find & Connect also has information about the organisations that ran these institutions, government departments, legislation, events and information to help people find records relating to their time in ‘care’. This section has some tips on how to use the Find & Connect web resource, to find your way around the website and get the information you’re looking for. The Home page is always a good place to start. The Find & Connect Home page is organised around 4 main functions. A lot of people use the Find & Connect web resource to find information about a particular Home. A search on the ‘Look for Homes’ section will bring up information about orphanages, children’s Homes and other institutions, including links to photos and records information. Another option is to search on the ‘Look for Photos’ section, which brings up images related to Homes, orphanages, institutions, events and organisations. 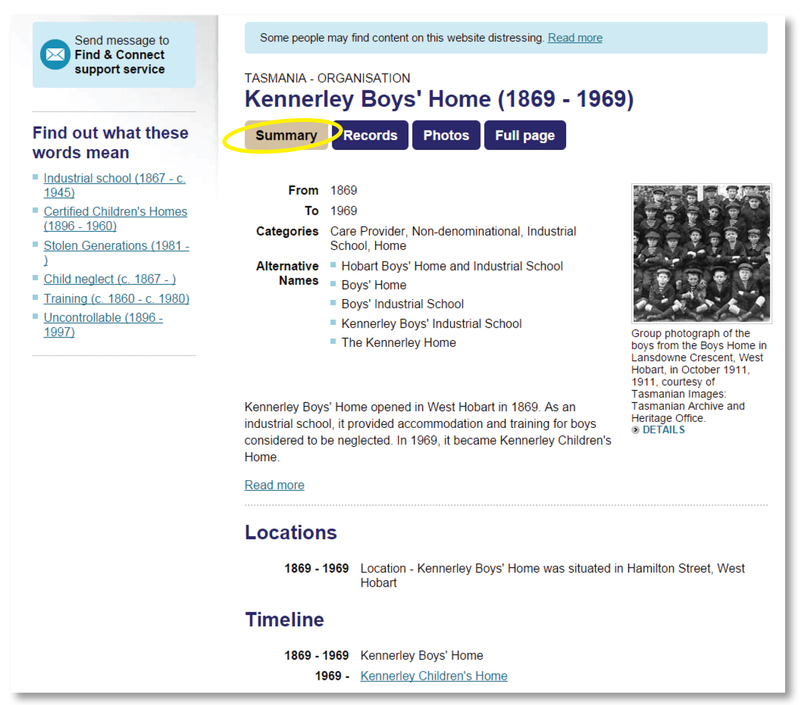 This page has information to help explain how to find records of people who grew up in ‘care’. It has fact sheets about popular research topics and tips to assist with searching for, locating and accessing records. 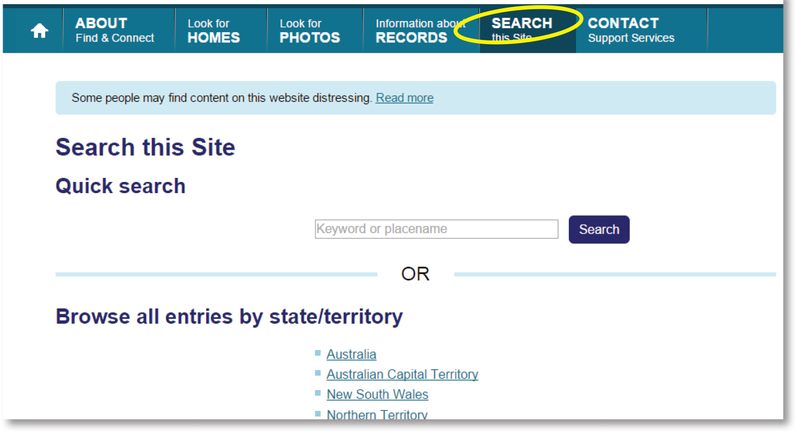 On this page, you can search the entire Find & Connect website for information about Homes, photos, as well as entries about organisations, legislation, events, glossary terms and more. Under the name of the Home, there are four tabs to help you get to all the information about that Home. You can click between the tabs to see different information – the active tab is the light brown colour. This tab shows a summary of the key information listed on the web resource about the Home: the From and To dates for the Home (or the year it opened and closed); the Categories it is listed under (for example, Catholic, Protestant, government-run) and any Alternative Names that the Home was also known by. Below this key information, there is a one paragraph “summary note” about the Home. This contains basic information about the Home, its location, who ran it, who lived there, and when it was operated. The Read more link under the short summary expands the description to show more information. These extended histories can vary in size depending on what we know. The Locations heading lists the street address of the Home (if known) and the dates when it was situated there. If a Home moved location, this is also recorded here. 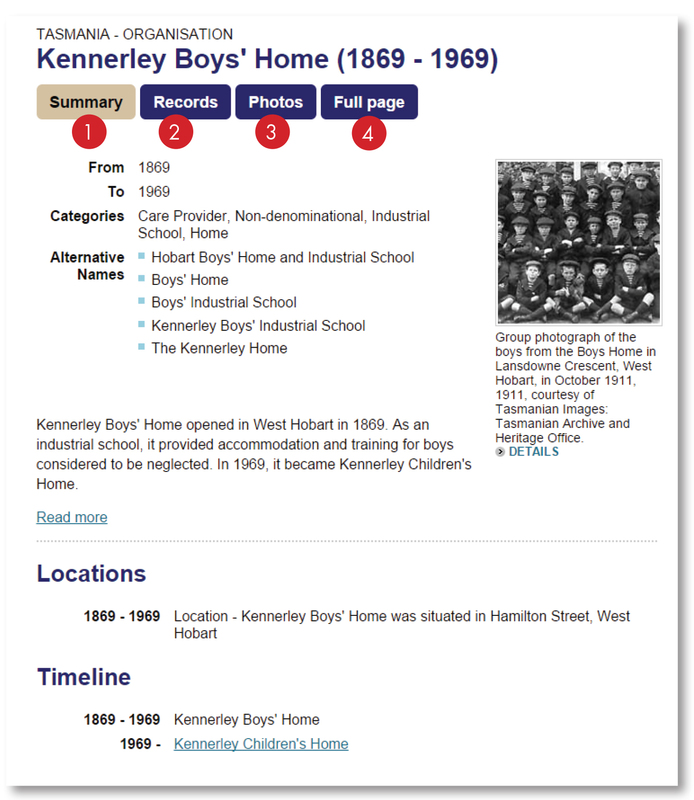 The Timeline shows the Home along with previous or subsequent organisations relevant to its history. The Timeline has links to the entries about these previous or subsequent Homes. Where there is a photo available the summary tab will display a thumbnail on the right of the content. Sometimes, to the left of the Summary tab, you will see a heading “Find out what these words mean”. Under this heading, there are links to Glossary Terms, that explain difficult-to-understand words. This tab shows all the records that we know of about a particular Home. There can be many different records collections related to a Home. Each of the record entries shows the Title, Date Range, Reference information (such as call numbers) and Contact details (who to get in touch with to get access to the records). If you click the DETAILS link, you will go to another page with more information about the records. Oral history interviews also sometimes appear in the Records tab. This is because the Home was mentioned in the interview. Sometimes these can be useful in adding context when little information is available on the Home, or by providing personal recollections of the Home from other people who were there as children. 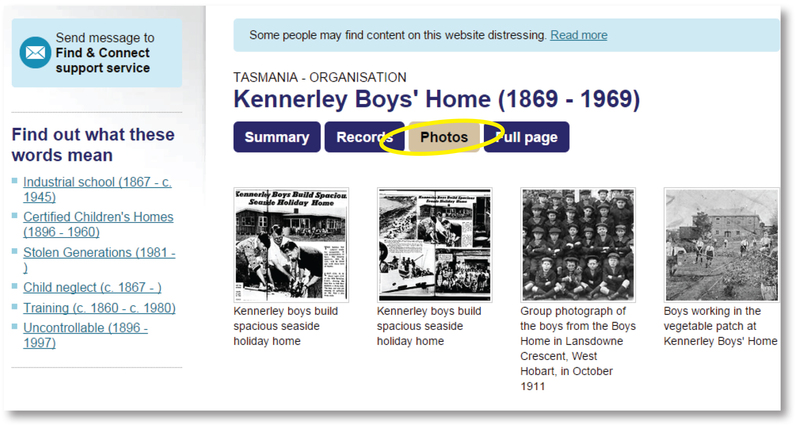 This tab shows thumbnails of photos and other pictorial links such as newspaper articles related to the Home. You can click on the thumbnail to go to the Image page, which will have more details about the photo. An Image page will have the photo’s title, date, copyright ownership (rights) and a link to where the image is sourced from. It may also include a brief description of the image. Any related organisations, glossary terms, events, legislation and publications will be listed. Note: When you click on thumbnail images from an image entry, you will be taken to an external website (such as to a State Library website) to view the full image or in some cases an image viewer. The web resource always includes information about where the photo is held and any relevant information about copyright. The Full Page tab takes you to the full version of the entry, bringing together all the details listed in the Summary, Photos and Records tabs, plus additional information. In the Full page, information about the Home is set out a little differently. For example, the information about Records is listed under the headings: Related Archival Collections, Related Archival Items or Related Archival Series. The photos for this Home are all included in the Gallery at the bottom of the page. The Full page also has details of Publications relevant to the Home, with links to any material that is available online. Some Homes will have Related Glossary Terms, with links to explanations of difficult-to-understand terms. When you are in the Full page view, you’ll see that the internal navigation is different. Instead of the 4 tabs (Summary, Photos, Records, Full page), there are only 2 – Summary and Full page. If you want to get back to the 4 tabs, just click on Summary. In the Full page view, on the left, there is the “Look for similar” heading. Clicking on these links will take you to alphabetical lists of other Homes that have the same categories (eg Catholic, Industrial School, etc). In the Full page for some Homes, you will see links to Related Legislation. Some Homes were licensed under the provisions of a particular Act, or a new law might have been the reason why a Home was established. Clicking on these links takes you to a Legislation entry, with links to the full version of the statute, and an explanation of why the law was important in the history of child welfare. Browse lists of Homes in different States and Territories. To search simply type the search term into the search box. Options to Refine Search will be provided on the results page, you will notice the ‘Homes’ option has already been selected. For more information about the search and how to use it go to the Search Tips page. Once you select a result you will be taken to the Summary tab of a Home entry. Instead of searching for a term, you can Browse lists of Homes. There are 3 different types of Browse lists. This is an alphabetical list of Homes in a specific State or Territory. The Look for Photos page is similar to the Look for Homes page. On the search results page, you will only see images that match your search. To Look for Photos simply type the search term into the search box. Options to Refine Search will be provided on the results page. Photos has already been selected because the Look for Photos search box was used. For more information about the search and how to use it go to the Search Tips page. Once you select a result you will be taken to the Image entry, on that page any related organisations, glossary terms, events, legislation and publications are available. 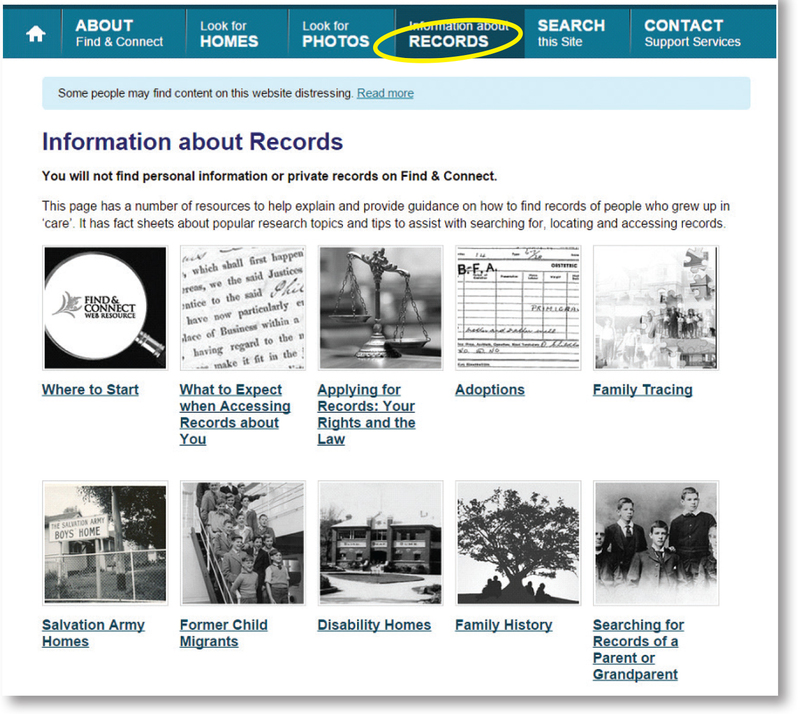 The Information about Records page has a number of resources to help explain how to find records of people who grew up in ‘care’. It has fact sheets about popular research topics and tips to assist with searching for, locating and accessing records. 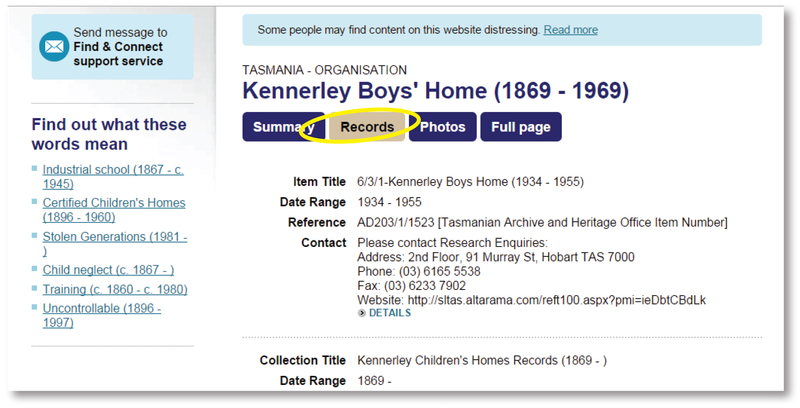 The Information about Records page has general information to help with the search for records. 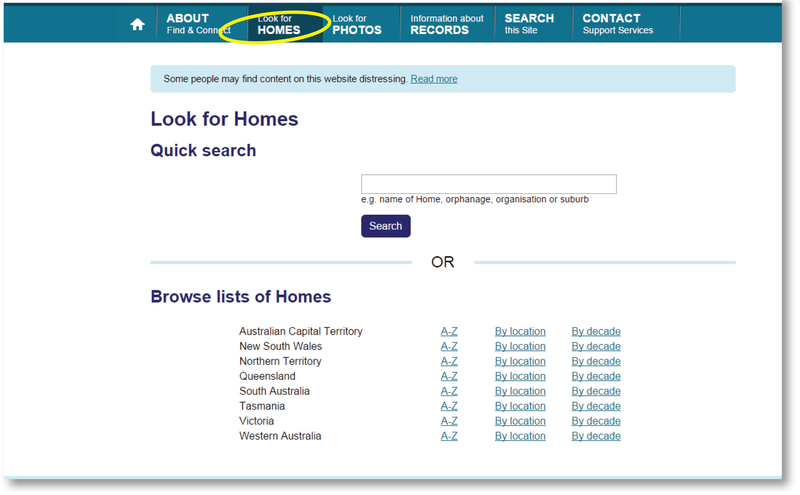 To find information about what records exist for a particular Home, search for that Home on Find & Connect, and then click on the Records tab (this is explained in the Finding your way around a Home entry section). On the Search this Site page, there are 2 options – you can search directly via the search box, or if you prefer you can Browse lists of all entries by state/territory. To search simply type the search term into the search box. The search on this page searches Homes, photos, records information, organisations, legislation, events, glossary terms and publications. Options to Refine Search will be provided on the results page. No options have been pre-selected using this search. For more information about the search and how to use it go to the Search Tips page. This option takes you to alphabetical browse lists for all the entries in each state and territory. 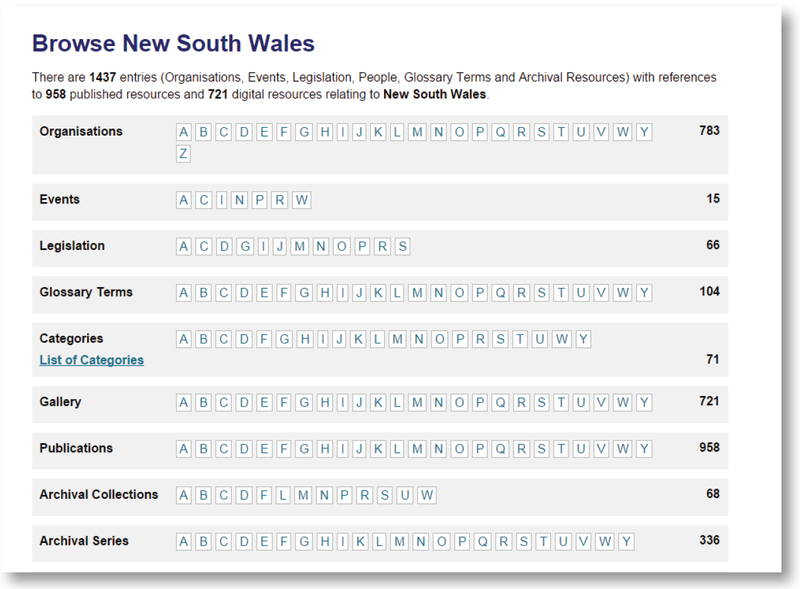 For each state and territory there are alphabetical lists of organisations, events, legislation and glossary terms. The category lists allow you to see all entries from a particular category e.g. Catholic, Babies’ Home, Hostel, etc.